The Time Timer is one of my favorite parenting discoveries. This counts down time (up to an hour) visually. 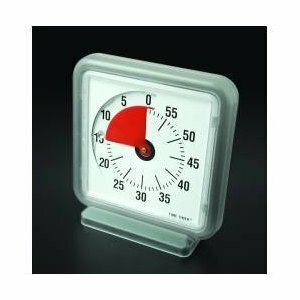 Its perfect for showing kids how long they have to wait for something or for doing time outs or rest time. When I first heard about this I splurged and bought one at full price. Even at $25 it was worth it to avoid having to hear "how much longer?" over and over again. Yesterday I found 3 of these at Value Village for $3 each. I bought all three. I gave one to my sister in law and have one ear marked for a friend I know would be into it. The other one I guess I will hold on until I think of someone who could get good use out of it.